The importance of using a reliable and recycled paper has increased dramatically. Together with a rise in digital print it is becoming increasingly important to find a sheet that ticks all the boxes and gives you excellent print results to be proud of. Digigreen has been developed exclusively with this in mind. Providing exceptional printing quality while meeting even the most stringent environmental standards. Available in a comprehensive range of digital sizes from 100gsm to 350gsm, in both Gloss and Silk, Digigreen is available in reams, cut to the exact size required by your digital press, from SRA3 to the iGen 3 and 4 formats. 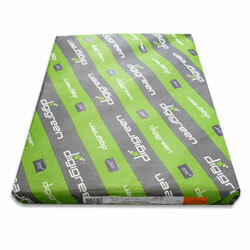 Digigreen paper has won the Best Environmental Substrate award, voted for by the European Digital Press Association (EDP). Premium, ultra smooth coated recycled paper, guaranteed for digital printing.